In 2003 the government announced the abolition of fees for Primary (elementary) education. Over a million children flocked into school, overloading all resources. Somehow the system struggled through the major growing pains, assisted mightily by donor funds, especially from the UK. While we were at the Maseno training last week the news broke of huge corruption in the Education Ministry with millions of shillings siphoned off from feeding programmes, books and supplies budgets and --the favourite-- fake workshops for teachers. The UK has halted all donations and parents and schools are panicking about covering the costs for the new school year which starts next month. The president (who has sat silent through major scandals such as Goldenberg and Anglo Leasing, allowing the perpetrators to continue with impunity) is reported to be furious since the primary education programme was to be his 'legacy', allowing him to be fondly remembered in the history books. More revelations are coming out by the day and the sum of 9 billion shillings is being mentioned (1 million is roughly $15,000) The first accounts spoke of just a three month period this year where Sh100 million is unaccounted for by legitimate bookkeeping. -In one workshop Sh 731,000 was claimed for water. This would buy nearly 15,000 bottles. -Sh 1.5 million supposedly was spent on computers and books at a Nairobi school . The items are not to be found. -Sh 600,00 was allegedly spent to rent a laptop for a month--total was Sh 4.2 million. During this time the ministry had 52 computers in store. Plus the cost of buying a laptop is around Sh 50,000. -An officer who had been given a government vehicle to travel to Mombasa from Nairobi also claimed money for a return air ticket. -Sh 24,000 was claimed for fuel for a college bus, yet the training was residential and nobody used the bus. 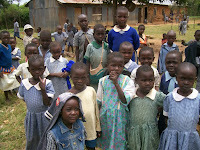 -Sh 70,00 went to a fictitious payment for serving porridge to workmen putting up a classroom. These are but a few examples and the tip of the iceberg. The systematic looting of the funds extends from the top officials in the Education Ministry down to minor civil servants, head teachers and boards of governors. So far, no one has resigned or been suspended. On Sunday Dec 13 we held our first meeting of our Kenyan advisory committee. There was lengthy and lively discussion of all aspects of our mandate and we know the whole group is willing to help us to improve the lives of the rural poor. Richard will be heading a small subcommittee to look at our guidelines for putting in water (wells or protected springs) His past experience and expertise will help us avoid pitfalls over land titles and negotiations with committees. Reuben is willing to donate the use of his brick making machine for producing blocks from compressed earth. After the meeting Tembo gave some funds for cement, transport and labour and the team set to work on the earth that had been thrown up out of the dug well at Imulama. we'll have pictures soon. Grace will be our education contact and will help with student monitoring while we are away. 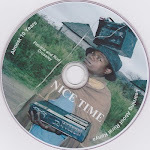 Isabellah, Carolyne and Bibiana will cover micro finance and income generating projects such as rabbit keeping, while Julius will continue to work onsetting up fish ponds. Last week we heard that we have received the Rotary Grant for the 'adopt a village' project at Emmaloba. We will continue to work with the Read for the Top and Adult Literacy projects which we had already started with Tembo funds. This money will come back into the Tembo account as soon as the funds are transferred to Maseno Rotary Club. Some aspects of the grant will have to be deferred until we return because our time here will grow short. However, we plan to set up as many structures as we can before we leave. the grant has a two year life span, so next fall should see things in full swing. We held very successful Virtues training sessions in Maseno the week of December 14. The first welcomed twenty participants who have done the basic training in Virtues. They returned for a ‘deepening’ session, to share their experiences and to support each other. Without exception all participants testified to the positive effects the Virtues has given to their schools in terms of discipline and performance. We had hoped for more participants, but the problems with school funding made it difficult for many head teachers to send their staff members.The serious problems with primary funding were a topic of one of our ‘examples’ during the training.Apart from direct benefits to schools, we also know that the Virtues assist us in conflict resolution and healing. The second session involved fifteen new members for Virtues, mostly teachers. They went away as changed people and determined to spread the word about how Virtues can improve schools and communities. 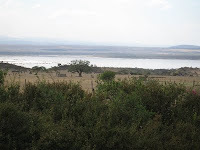 Lake Elementaita is on its death bed... We have always loved to visit Lake Elementaita Lodge. 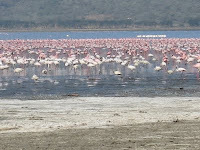 It is situated above one of the smaller saline lakes which is a breeding ground for the lesser flamingo and a vital breeding ground for the pelicans that live in lake Nakuru. It is also home to between 350 and 400 bird species. The lake was once fed by two rivers. One, Mbaruku, became seasonal in the 90's due to degradation of the catchment areas and later dried completely. The other, Karinadusi, flows from a hot spring but is being drained upstream for irrigation. The lodge sits on a rise above the lake and was once the home of a British army officer who settled there in colonial times. The carefully cultivated grounds were full of lush plants and exotic coloured bougainvillea. The second tragedy is also man made. December is the traditional season for girls to be 'circumcised' . Unfortunately efforts to eliminate the practice have met with mixed success, most especially in the traditional, rural areas. Last week two pregnant girls of 15 and 16 were forcibly 'cut' in preparation for their marriage. In the Pokot community it is a taboo to marry uncircumcised women and girls who fall pregnant have to be initiated before giving birth. Some 140 under-age girls have been circumcised in the larger West Pokot District since the season started last week. One organization (unnamed) that fights the practice has written to the UN to force the government to intervene and save 350 girls expected to be circumcised in North Rift province this season. It is possible to even have the cut performed in hospitals, supposedly with less risk of infection and complications than with the traditional dirty knives and unsterilised sewing equipment. Some courageous girls flee their community and take refuge with religious or other institutions. However, this normally means that they can never return home to their family. FGM promises a future of gynecological and obstetric complications for women. Canadian MP Keith Martin wrote a few days ago to the UN and to the African Union condemning the practice and urging the government to take more forceful action. We met today with a group that confirms our faith that the people of Kenya are able and willing to work out their own solutions to their problems, given the right tools. Thanks to Bibiana, the town councillor, they have registered their group and are well organized for the start of the project. I took a wonderful video of their singing to greet us, but fear it will be much to slow to upload. product. My only warning was that they were not asking enough money! They should make the current batch an 'introductory offer' and put up the price in the new year. It will still be much less than the supermarket and just as efficacious. We need now to think of labelling to make it more attractive and to spread the contact information. Cow dung fuel is also making a difference to the costs of cooking and the time women gain from not trekking through fields and woods looking for firewood. Rod has been doing lots of experiments on making compressed blocks for building with local soil and a little cement. The results are encouraging. We plan to use the earth dug out of the two wells now going in. Our big problem was finding or making a machine. Two weeks ago we met Reuben (who will be on our Tembo committee) and who has a machine. His problem was start up to use it. We discussed using his machine at Imulama and Muluanda. Our second problem was training people to make the correct mixture and operate the machine. Today we met two people at Muluanda who have been trained by an NGO in making interlocking blocks from earth but who have had no opportunity to put it into practice. When we dig the well, they will be able to use the spoil and put up a demonstration wall.